Harada-Yasutani (also known as The Sanbo Kyodan or “Three Treasures”) school of Zen was established in Japan by D.S Harada Roshi and his student and close collaborator H.R.Yasutani Roshi. The school, one of the most energetic and iconoclastic Buddhist organizations in the post-war Japan, combines elements of Japanese Soto (esp. teachings of Dogen Kigen and his Dharma grandson, Keizan Jokin) and Rinzai (esp. 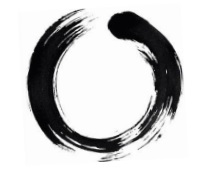 teachings of Hakuin Ekaku) traditions while its ‘graduates’ constitute the lion share of all Zen teachers currently active in USA, Germany, Switzerland, Philippines and Australia. Ban Roshi was born in Hanamaki City (Iwate prefecture) June 4, 1910. 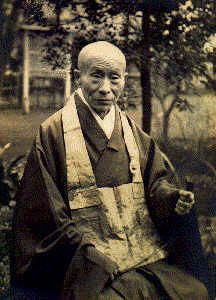 He was ordained as a Soto Zen monk by Fuchizawa Chimyo Roshi July 9, 1917, and received Dharma transmission from him. From 1931 till 1938, he practiced in Hosshinji temple. He became a student of Komazawa University in 1938 and graduated in 1941. After war he became a “tanto” of Hosshinji in 1947, and also a “tanto” of Hoonji (Iwate prefecture) in 1948, and became a master of Toshoji. He received Dharma-success (Inka) from Harada Roshi. He established two temples in Japan, Kannonji (Iwate) and Tetsugyuji (Oita). He retired from Toshoji May 10, 1992 and died January 21, 1996. He was 87 years old. Rev. Silverman was born in Pittsburgh, Pa and graduated from Carnegie-Mellon University. At a young age Silverman went to Asia to pursue various interests in philosophy, art and the martial arts. 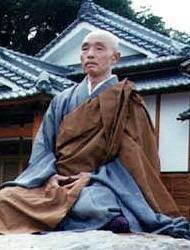 Part of his training was under the supervision of Zen Master Ban Tetsugyu Roshi. Ban Roshi was the disciple and close student of one of the most important Zen Masters of the 20th century, Harada Daiun Sogaku Roshi. Ban Roshi designated Rev Silverman as his final official dharma heir. He gave Silverman the Buddhist name Tesshin which means “iron heart”. After several years of running Ban Roshi’s mountain training temple, Tetsugyuji, Silverman was named the head Abbott of the temple 1993. He is the first westerner ever to be named the head of a Zen temple in Japan. Silverman also earned an MBA from Oita University. Although still the functioning head of the temple, Rev. Silverman relocated to New York fifteen years ago. Currently he runs a successful consultancy company in New York and volunteers as the only Buddhist Chaplain for several hospitals and the Disaster Chaplain Services of New York.